Giuseppe Verdi's fiery opera Il trovatore will be broadcast live to cinemas from the Royal Opera House on 31 January 2017 at 7:15pm GMT. 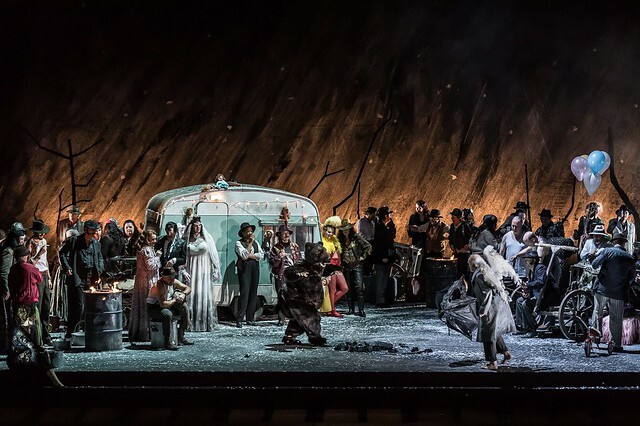 The first revival of David Bösch’s Royal Opera production strikingly pulls out the opera's prominent themes of jealousy, revenge and love against a hauntingly beautiful wintry landscape. Read audience reactions to the Season opening performance. Enhance your viewing experience by downloading our Il trovatore Digital Programme for free using the promo code FREETROVATORE. The cinema relay will be presented by TV and radio broadcaster Clemency Burton-Hill. Before the opera starts, the tragedy has already been set in motion. To avenge the murder of her mother, a gypsy called Azucena abducts the younger son of the Luna family. When the opera begins, Azucena’s foster son Manrico and the military commander Count di Luna have become rivals in love for Leonora. Azucena has a secret that affects both men: will she tell it, or will she see her revenge through at any cost? 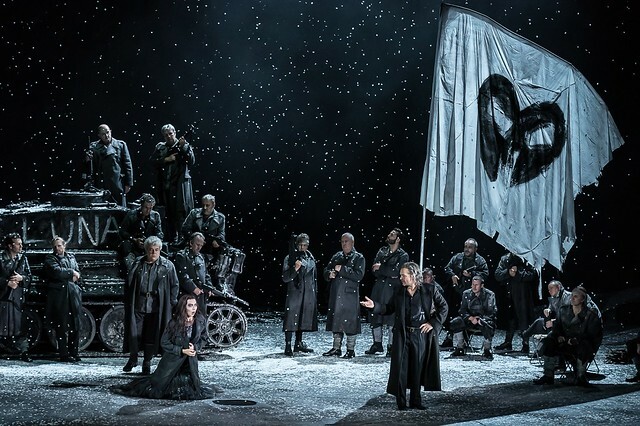 Il trovatore is among Verdi's most highly regarded operas and features a beautiful score of reflective arias, impassioned duets and fiery choruses. It is famous for its 'gypsy' music, in particular the memorable Anvil Chorus. The score's other highlights include 'Tacea la notte', which shows Verdi's prowess not only in creating big tunes, but also psychologically rich music which drives the drama through the expression of complex characterization. Verdi also makes it clear that Azucena, a mezzo-soprano, is Il trovatore’s most important female character, and one of the most challenging mezzo-soprano roles in all opera. 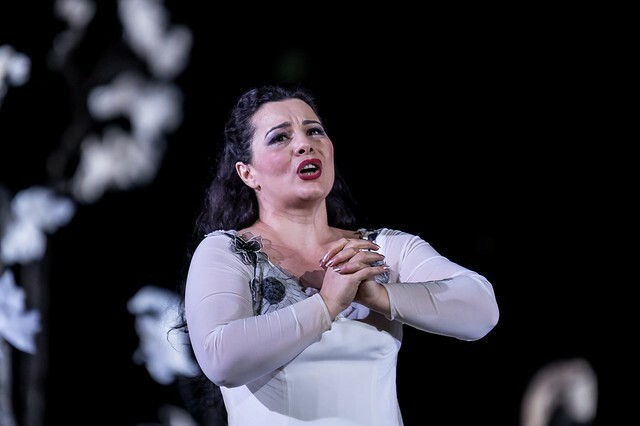 The first revival of this opera features a stellar cast including Georgian mezzo-soprano Anita Rachvelishvili as Azucena, American tenor Gregory Kunde as Manrico, Armenian soprano Lianna Haroutounian as Leonora and Ukrainian baritone Vitaliy Bilyy, who makes his Royal Opera debut as Count di Luna. Read audience reaction to the 2016/17 opening night of Il trovatore and add your own review. After the relay, we will publish a roundup of audience tweets, so share your thoughts with the hashtag #ROHtrovatore. The production will be relayed live to cinemas around the world on 31 January 2017. Find your nearest cinema and sign up to our mailing list. Il trovatore runs 1 December 2016-8 February 2017. Limited tickets are still available. The Digital Programme has been updated with new content, but there have been a few technical issues with it appearing. It's to do with the fact that this programme was created for a production that appears in two different Seasons. If you'd like to know more, I can put you in touch with the Content Producer in charge of the digital programmes who will be more than happy to provide further information. Once again, we do appreciate your feedback as it draws our attention to these kinds of bugs. Estamos, meu marido e eu, em São Paulo, Brasil. Amamos ópera e sempre assistimos.